The Boone Central Cardinals scored impressive victories over Columbus Scotus and Central City to win the C1-7 Sub-District basketball tournament and advance to the C1-4 District championship game Monday against Hastings St. Cecelia. The winner of the Boone Central (18-3)-St. Cecelia (19-2) contest was to advance to the 2008 Nebraska Boys State Tournament. St. Cecelia reached the district final with wins over St. Paul and Minden in the C1-8 Sub-District. 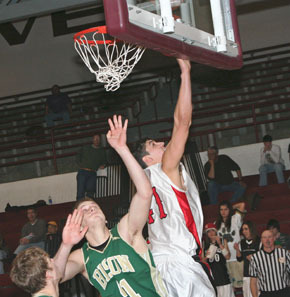 Boone Central defeated Columbus Scotus in Sub-District, 58-35, and trounced Central City, 60-30. Complete details in Print Edition of the Albion News.